SUNY Maritime College is one of six state maritime academies in the United States. 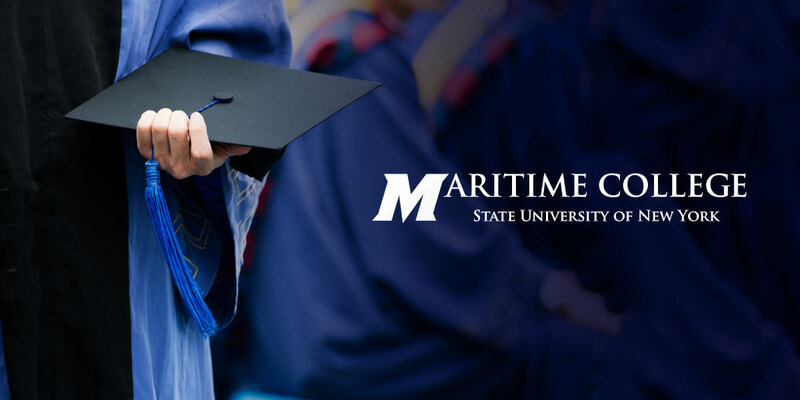 Located 30 minutes from midtown Manhattan, Maritime College educates dynamic leaders for the global maritime industry. Offering 11 undergraduate majors, including five ABET-accredited engineering programs and two master’s degree programs, a distinctive hands-on approach to education prepares students for career success. 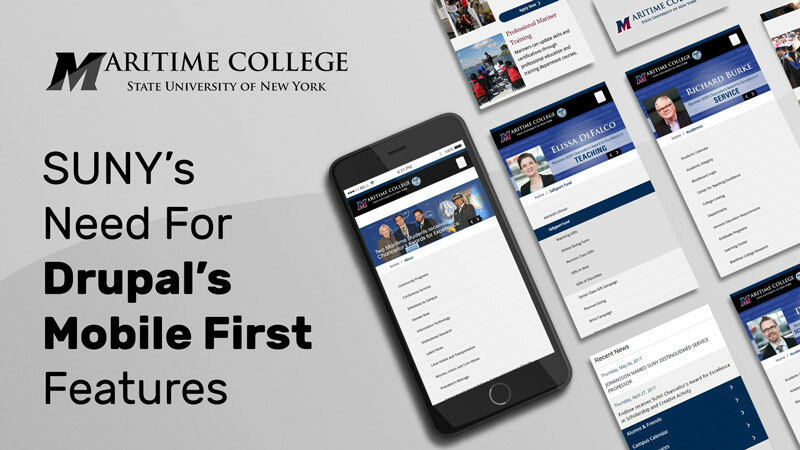 State University New York (SUNY) was looking to upgrade their existing website to a robust, open source CMS for better content management and to serve prospective students on mobile. Adhering to strict deadlines so that the projects were finished before the next semester started, Axelerant’s agile team translated the current website structure, layout, and design to suit Drupal 7. The team constructed a responsive layout for mobile and successfully migrated SUNY’s assets just in time for SUNY’s maiden voyage with Drupal. The client faced difficulties in managing content via the original .NET admin user interface. This site was not responsive for users and Axelerant needed to move quickly to provide modernized user experiences to SUNY’s key student-centered, mobile-focused demographic. 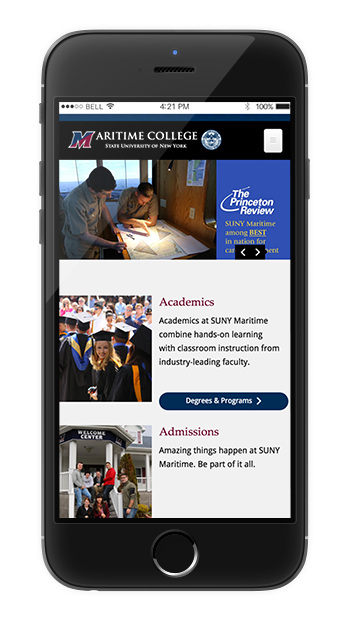 Due to SUNY Maritime’s emphasis on continuity and a seamless user friendly transition, the front-end UX design of the website was retained. Our focus was to ensure site experiences were consistent and fluid; design enhancements were set for a later phase per priority. The site’s content was organized into various departments—each department having its own landing page and hundreds of secondary menu links arranged in custom sidebars.These could not be part of the site build, since various links directed users to static content pages. After the content migration was complete, the team generated all secondary menu links for each of the page nodes. The .NET website did not include a content moderation system, so all content editing and approvals were done through email notifications. Media uploads were a two-step process—uploading and then linking to content pages. In order to improve the ease of use for administrators, Drupal’s workbench moderation and media module features were implemented to make content publishing easy and streamlined. Axelerant’s front-end team redesigned key landing pages and implemented a responsive theme so the university’s content would be easily accessible by mobile users. SUNY mandated that mobile content would undergo minimal changes to ensure consistency. SUNY wanted to replicate its folder and directory based access control in the new website. This meant that members can modify contribute only to those department which they have access. We leveraged drupal’s Taxonomy based access contrib module to achieve this. We also replicated the Explorer style UX using a combination of views and node pages. "It's been great working with you. You really seem to understand our goals. Things are explained clearly, and large tasks are dividing up into manageable sizes."